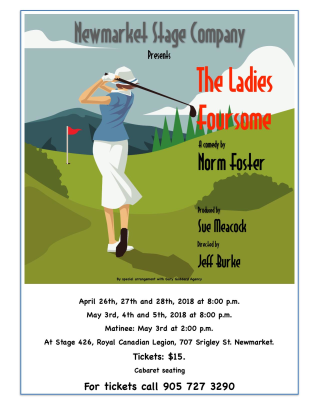 The Newmarket Stage Company is very busy working on the last play of this season — The Ladies Foursome — a comedy by Canada’s most produced playwright, and Newmarket native, Norm Foster. Jeff Burke is directing the 4 ladies who are playing golf but talking up a storm (or 2)!! Jo-Anne Pulfer, Susan Lane, Joanna Kaufman and Julie Wood are the Fantastic Foursome. Please come out and support us on April 26, 27, 28 or May 3, 4, 5 at 8pm or May 3 at 2 pm. Tickets are only $15!! By special arrangement with Gary Goddard Agency.